Stephen Sondheim’s “Follies,” first produced on Broadway in 1971, and not seen much since, still has relevance–especially in the era of HIllary Clinton’s run for President. I saw a wonderful revival of this very clever show last night at the St. Louis Repertory Theatre, and it got me thinking about what it says about the human experience–particularly that of women. . The story line of “Follies” is built around a reunion of the aging actors and dancers who appeared in a Ziefield-Follies-like stage revue from the early 1900s through mid-century. They get together in the theatre where they once performed, which is about to be torn down and replaced with a parking lot. The now middle-aged [and beyond] players reminisce, recreate some of their favorite numbers, and ponder the life choices they’ve made. Their younger selves shadow them as memories, reminding them of how they once saw themselves and their futures. It’s mostly about the women: the compromises they made, the pain they endured, the relationships they stuck with, even when they knew they were being betrayed [and, in some cases doing the betraying themselves]. 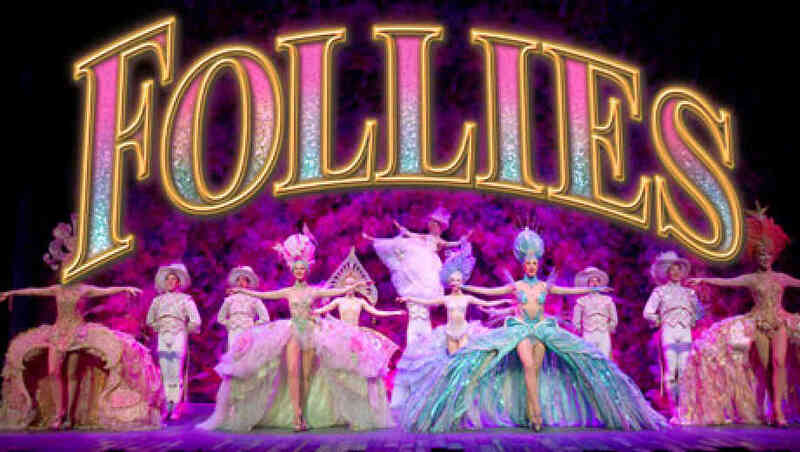 And, of course, the word “follies” refers both to the genre of those old-time stage shows and to the follies of the characters’ lives. The “boys” were the hangers-on in this story. They weren’t performers in the show, or even stagehands. They were stage-door Johnnies, waiting to take the girls on the town after the shows—in a role reversal from what we usually see. They see the “Beautiful Girls” celebrated in one of the show’s songs as trophies to be attained—not relationships to be nurtured. The show focuses on two marriages that emerged from those stage-door romances. The “boys” seem successful and happy, at first. But they slowly reveal their disappointments–mostly in themselves, and the remorse they feel for some of their ill-advised choices. But it’s the “girls'” revelations that really get to you. They gave up their career ambitions for the kind of husband-centered marriage that was expected. They waited at home for their often unfaithful husbands to return. They put off having children until it was too late. They tolerated their husbands’ neglect and basked in their fame and successes. So, what does all of this have to do with Hillary Clinton? [Yes, I tend to politicize everything.] The obvious connection is, of course, the way things have changed for many women. I think a lot of the mostly older people—especially the women—in the audience saw some of their own lives up there on stage. There were a lot of women for a lot of years who didn’t have career ambitions beyond marriage and motherhood [a noble profession, in my opinion, by the way]. But there were many who wished for other things, too. Some started adulthood accepting traditional expectations and grew, in later years, to seek opportunities for the public accomplishments and earning power previously reserved for men. One of the characters in “Follies” recounts her life through a song called “I’m Still Here.” With altered lyrics, it could be Hillary’s anthem—as well as that of many other women. Hillary Clinton took on non-traditional professional and public roles, and endured obviously sexist criticism from all sides, and she’s still here. She navigated extremely difficult times in her marriage—and she’s still here. And she continues to stand tall in the face of an unfriendly press and, of course, the outrageous meanness of the Republican party and its misogynistic standard-bearer, Donald Trump: and she’s still here. Most recently, she caught a case of pneumonia and still managed to show up at the 9/11 memorial program—and she’s still here. What more can we ask of here, for pete sake? I do wonder though, if sitting next to her younger self as the characters in “Follies” do, she would feel nostalgia for the unbridled idealism and successes of her youth, or feel regrets about some of the choices she had to make or paths she opted to follow. Recently, in two interviews with Humans of New York, Clinton spoke candidly about the sexism she faced in her early professional life, and about how she found herself building a protective wall around her emotions. We all have regrets, don’t we? I’d be surprised if Clinton doesn’t. But we probably won’t hear about them, if they exist, for many years to come: Admitting to such feelings would be seized upon in the political realm as a sign of weakness, I fear. I just hope that, in the end, she is able to do something that no other woman has done and becomes President of the US. I think we’ll all have regrets and remorse if she doesn’t. Next Post:Who benefits from NRA’s push for MO guns-everywhere law?